Even though this is a sequel, it stand completely alone. The type of mother Cookie is and the abuse suffered as well as the reasons why (there’s never a good reason), is explained here without the background of the book. Rosie and Norm, the two youngest children, were taken away from their older sisters, who were more like mothers. This is Rosie’s story from that time over the next 10 years, the foster homes, the moving around, the abuse, the hunger, the fear. I want to reread Etched in Sand, because I vaguely remember Rosie and the interactions being mentioned, but as Regina says in the intro to the book, she did not want to disclose Rosie’s story until she was ready to share it, so I think that knowing the background of this story — what was truly going on with Rosie — would illuminate Regina’s discourse about them being separated as she told her own story. This happened in the 70’s and early 80’s (I believe that Rosie is in her early 40’s now), and I have to hope that things are different now, as far as DCFS turning a blind eye to abuse from parents and foster families. Reading this kind of book opens my eyes and heart to kids who I do know are hungry or overlooked or emotionally or physically abused. 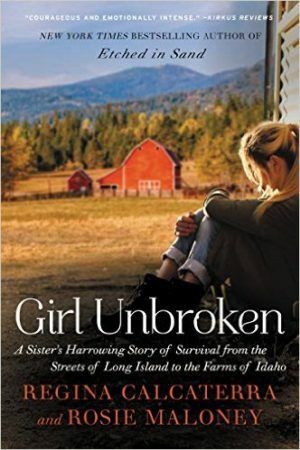 It’s a hard story to read, but knowing that they survived in spite of so many hardships growing up makes it a story of hope. I give both of these books my highest recommendation. You can read either one first, but I think I would have liked these details as I read about Gi trying to find or help or visit Rosie all those years. Find out more at the TLC Book Tours page and the Harper Collins book page. I hope that this kind of thing doesn’t happen any more but sadly I think that it still does in some cases. It is heartbreaking for sure.